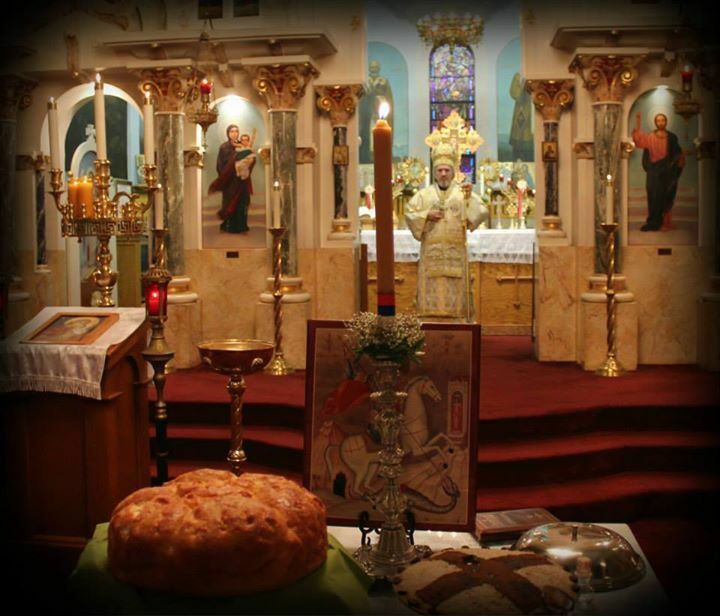 Midland, PA - On July 18th and 19th, 1949. when the Church in Midland was consecrated, it was decided that the church will be dedicated to St. George, and at the suggestion of St. Bishop Nikolaj Velimirovic that it should be called “Lazarica”. 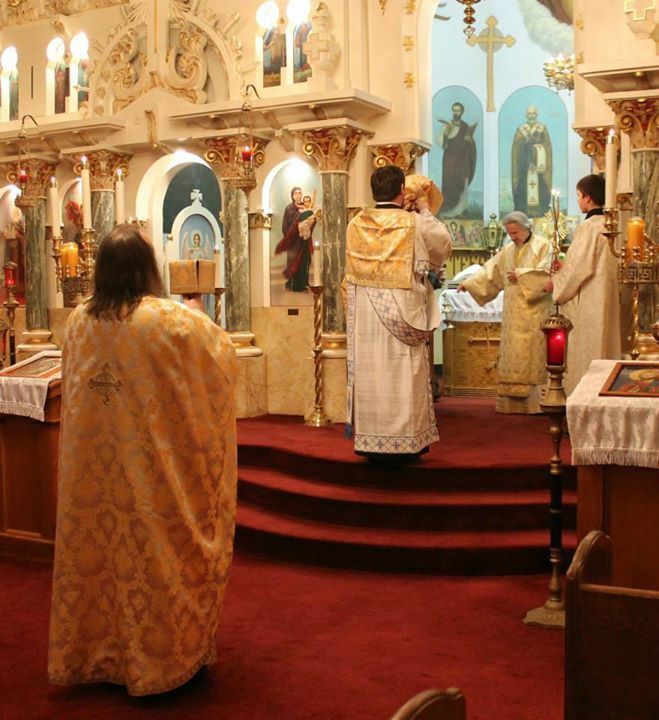 That’s when it was decided that because, at that time, most of the church parishioners celebrated St. George in May, then the church slava would be in November 16th, when we celebrate Djurdjic, the restoration of the Holy Temple in Lydda Palestine and the transfer of the relics of St. George. 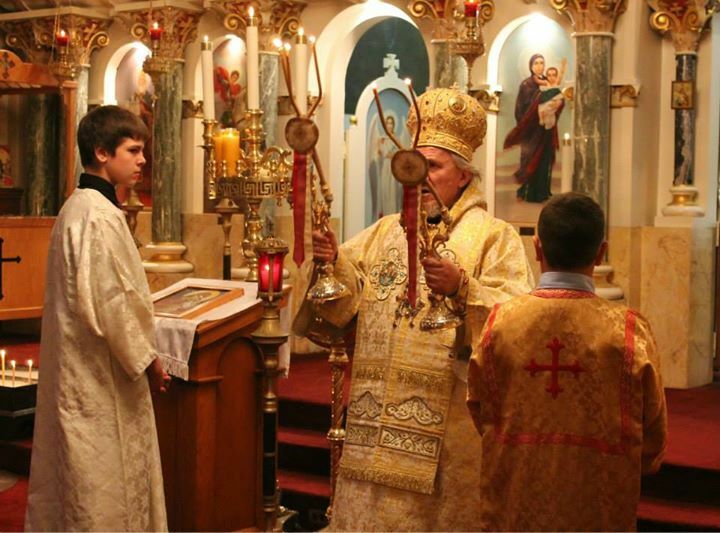 Since 1950 until today, 63 years, the Slava of our church has been celebrated continuously, on the day of November 16th or the closest Sunday to it. 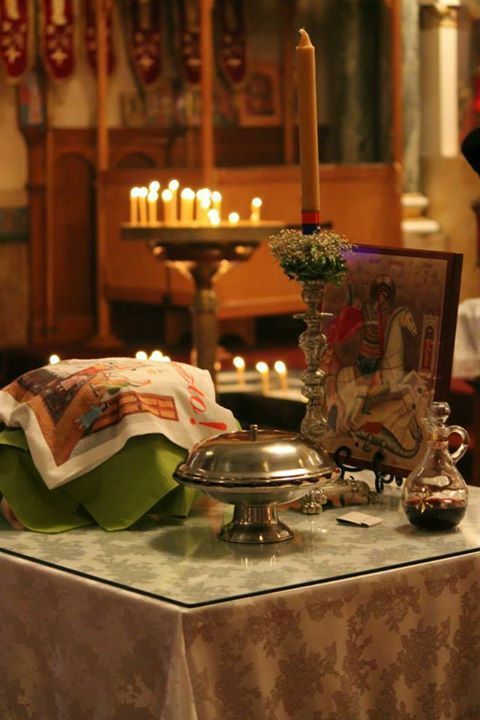 This year, too, we eagerly waited for the day of our Slava. 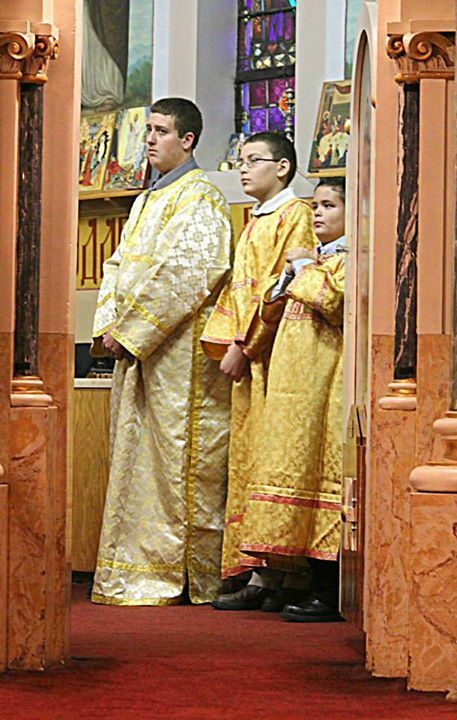 Days in advance, the priest and the parishioners, prepared everything so that things would run according to plan. 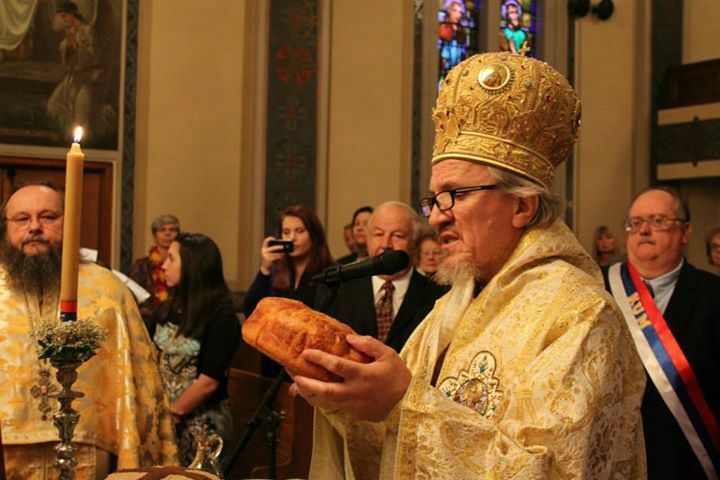 On Sunday, November 17th at 9:45 am, the Bishop arrived in front of the church, where, accompanied by the sounds of bells, he was greeted by the priest and the president of the Church Board Nikola Sudar. 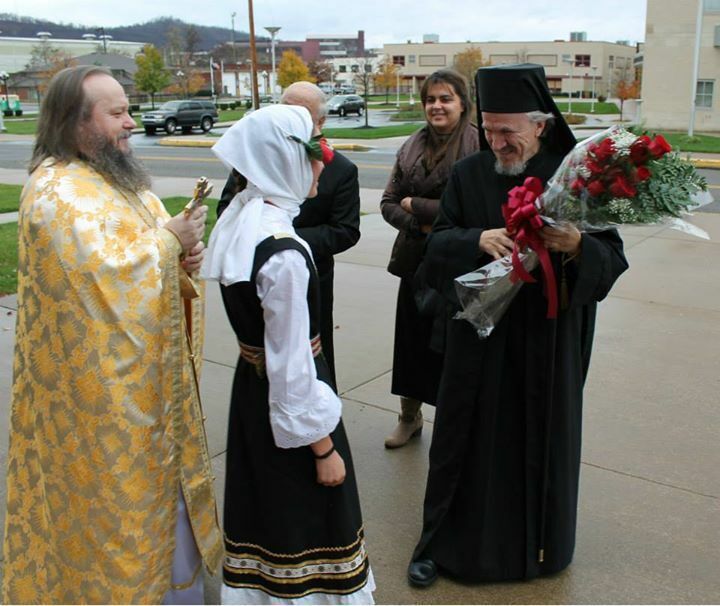 Malory Krah, who was in traditional Serbian uniform, handed a bouquet of flowers to his Grace, as a welcome. 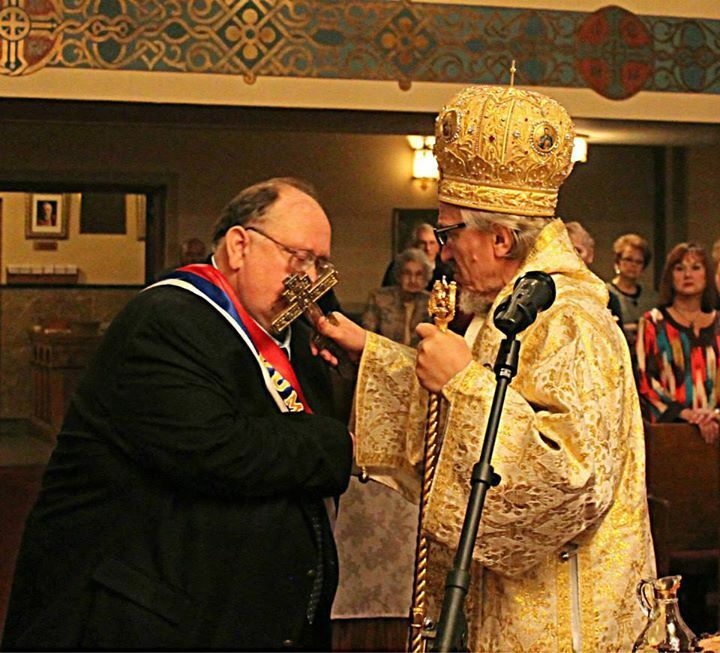 Father Milan hands him a cross while Father Deacon Branislav Golic goes before his Grace to censed and lead him into the church where the Choir meets him with the song Dostojno jest. 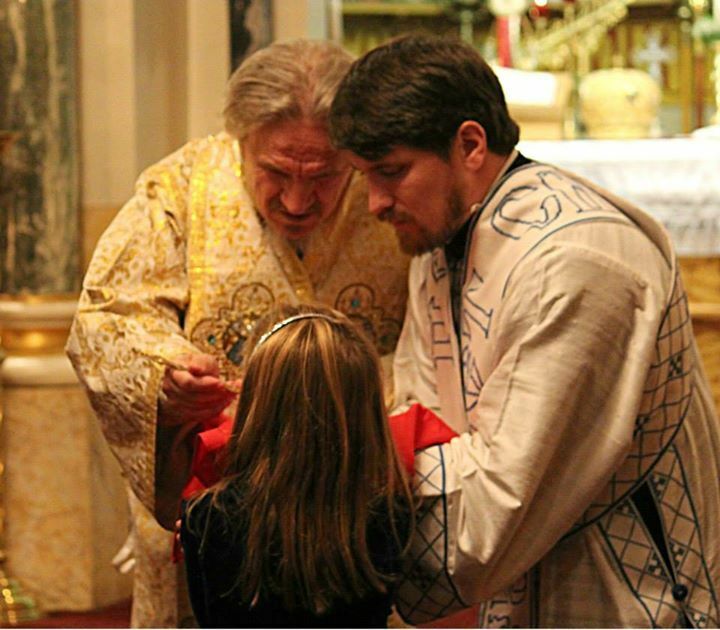 A group of altar boys meet the Bishop and after some time help him in dressing and washing his hands. 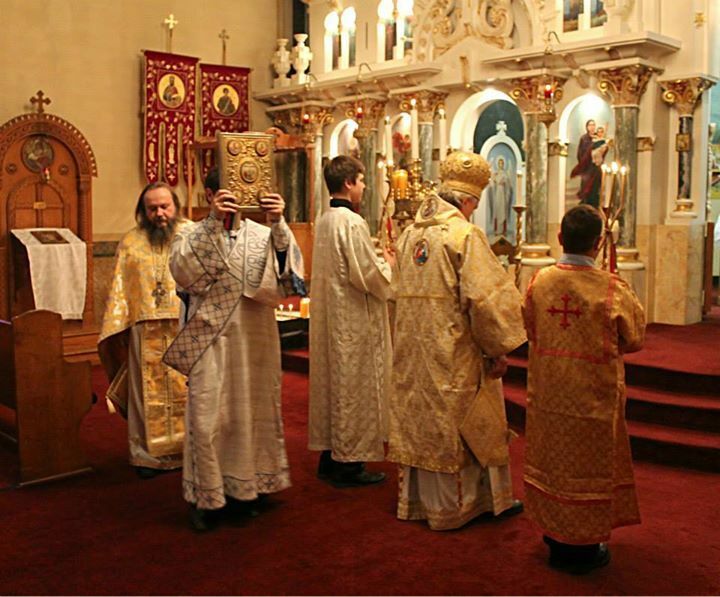 After the doxology delivered by the Deacon, the Bishop blesses the people, and upon receiving the blessings, Father Milan enters the altar and exclaims: Blessed is the Kingdom… and the Holy Hierarchical Liturgy begins. 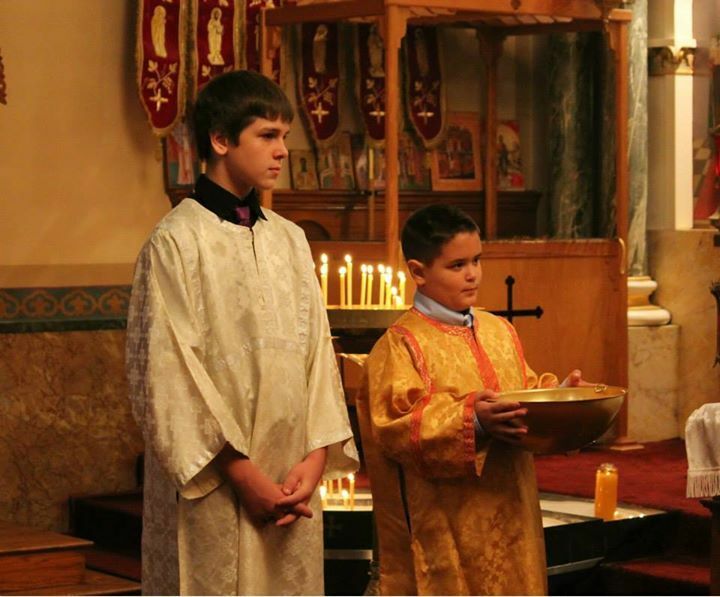 A great deal of altar boys (Corey Chaffee, Tyler Hawkins, Jackson Anthony, and Issac Long) under the watchful eye of Michael Vranes and Milovan Jovanovic, diocesan secretary, perform the duties seamlessly. 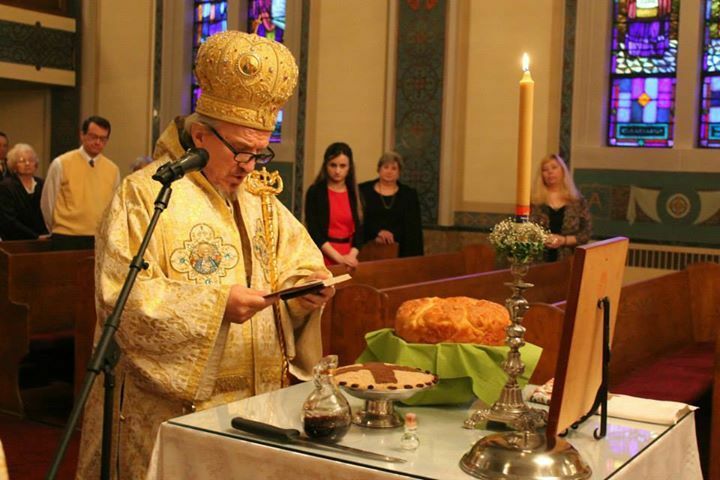 After the reading of “the prayer behind the ambo”, there was a planned litany about the church, but, due to rain, it was canceled, and so it went on to the concentration of the wheat and the traditional cutting of the slava Kolac. Later on, his Grace, have a sermon on the Gospel of the Sower, which was very instructive and inspiring, touching on the problems of today like the fast life, forgetting about the basic things in life which are the soul and the care for others, where instead of improving and bettering ourselves by investing effort and sacrifice, we prefer to turn to God to accept us as we already are. 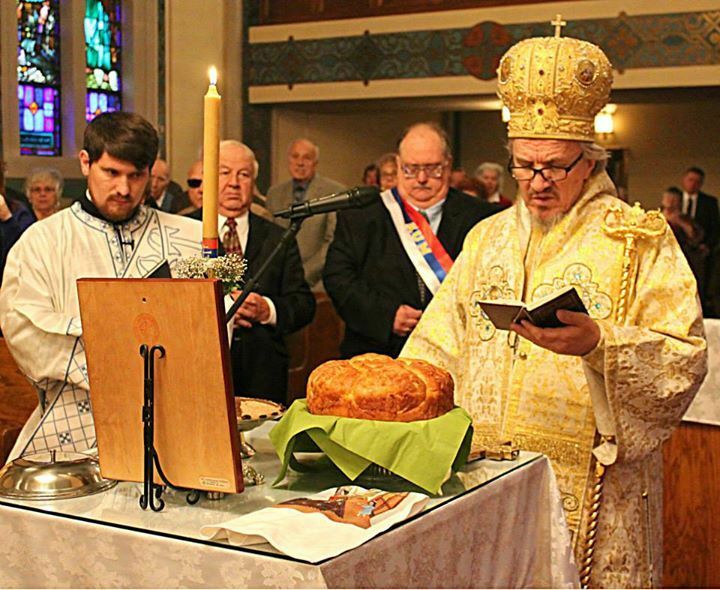 Upon handing out the prosphora and the icon of the miraculous icon of the Mother of God “Sićevačka”, all the faithful went down to the Serbian Club where the Slava lunch was to be taken place. The Bishop retired into the parish home, where there were he sat down with the priest and his family and guests. 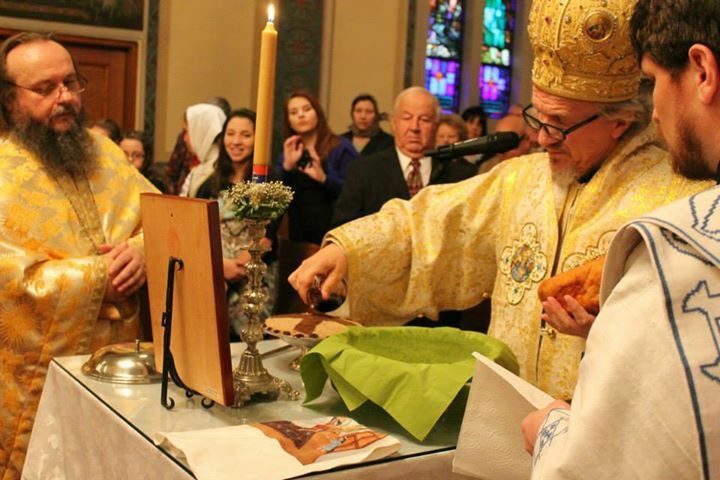 The choir welcomed the Bishop with “Ispola Eti Despota”, then he blessed the food with the troparion of St. George. The kitchen crew in the Serbian center, with Djako and Elaine, put in all of their efforts to make the Slava an unforgettable event. The children from the Sunday school did a wonderful job decorating the tables with lovely autumn center pieces which was all documented in photographs by Anamarie Bratich-Hawkins. Evelyn Adams, the choir director, greeted the guests near the end of lunch with beautiful words, and warmly welcomed the Kum of the slava, Steva Krchich, to say a few words which he did. Then the leader of Sunday school, Paula Esapovich said something about the kids’ participation in the preparations for the slava. 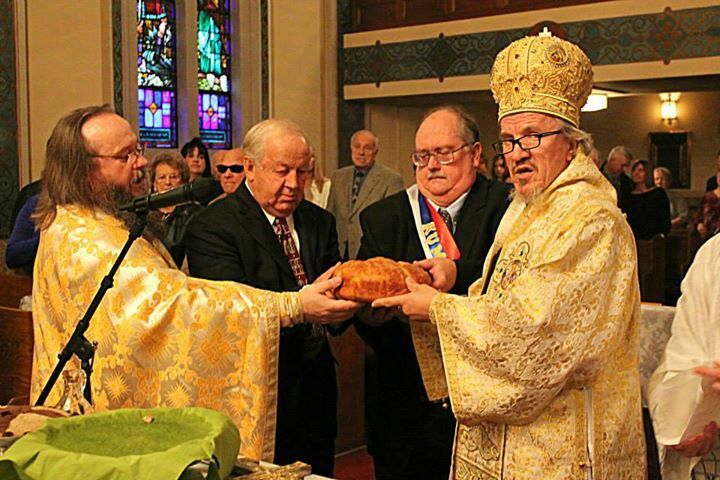 Then Evelyn also called up the president of the Circle of Serbian Sisters, Anka Vidakovich, and the president of the Choir Dr.Laza Kostich, Helen Janke, to say a couple words, which they bother did, wishing everyone a happy slava. Mr. George Volitich and his wife were then both called up to receive a plaque thanking them for their selfless caring and gifting to the church. 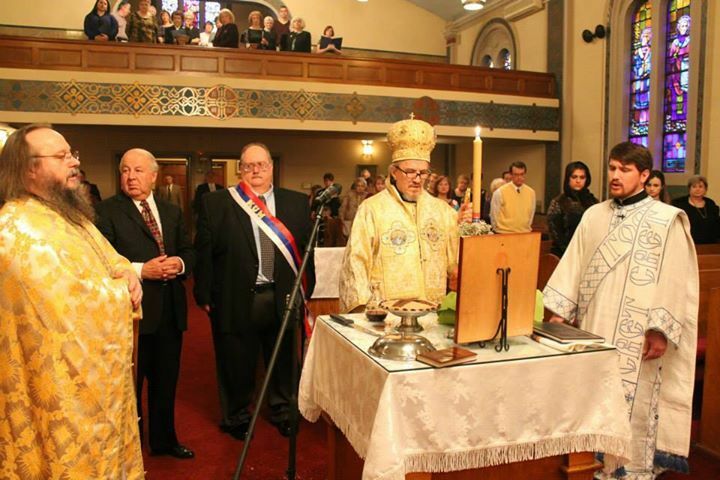 The plaque was presented to them by the president of the church board, Nikola Sudar, who also welcomed the guests and thanked the donors. Afterwards Father Milan took the microphone and welcomed everyone there present, thanking our Bishop for taking the time out of his busy schedule and brought Archpastoral blessings to our community. 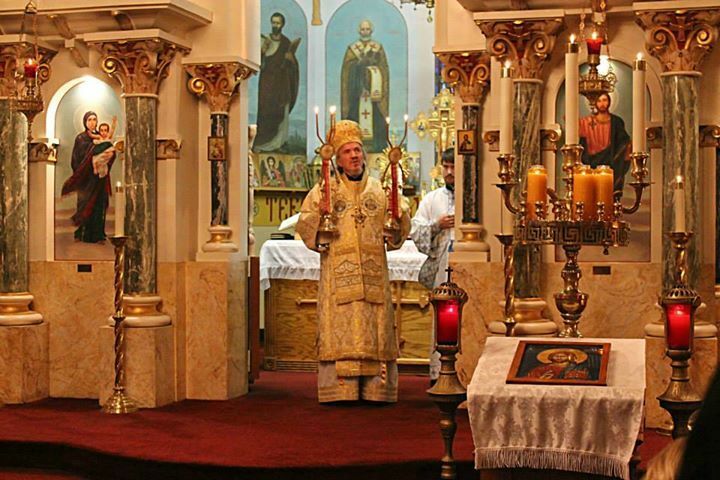 Finally, His Grace Bishop Mitrophan, welcomed all the guests with beautiful, vivid and kind words, expressing that he holds this parish, which is geographically one of the closest to him, especially dear, and so when the last priest was transferred, he made sure that this parish immediately obtain a priest, and one with great experience, Father Milan Krstic. 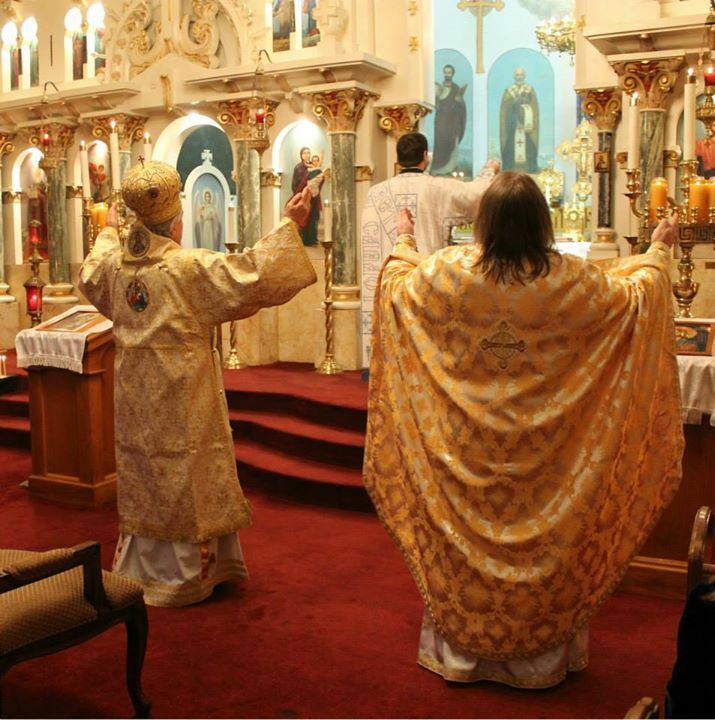 Upon completion of the sermon, a prayer was read, and singing Ispola Eti Despota, the people and priest escorted the dear guest wishing to see him again soon in our church. 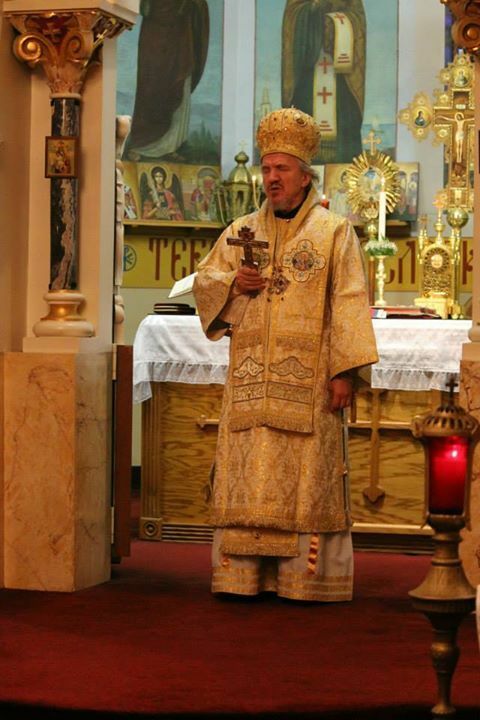 God grant you many years, dear Bishop! Mnogaja ljeta, Vladiko sveti!